The place of birth of Pieter Claesz, a Dutch Golden Age painter is undetermined. Some say that he was born in 1597 in Burgsteinfurt (now known as Steinfurt) in Münster, Germany while others say that he was born in Berchem which is near Antwerp. He’s known for his still lifes that were remarkably simple yet quite atmospheric in quality. He was not one to use crowded and complicated compositions but was highly known for his monochromatic use of colors for his signature “breakfast” paintings, where the meal is usually set in one corner of the table. What is outstanding in Claesz’s paintings were the play of light on the various objects on the table, delicately painted in all its richness over various textures that highlighted the solid form of each item. Pieter Claesz later moved to and stayed in Haarlem. When he was just starting out, Claesz used vivid colors which gradually became more subdued as he grew older. However, his composition became increasingly elegant, nonchalant and broad. He was a painter whose objects on canvas very seldom overlapped. Always, his main objective was to capture each particular reflected light in the most accurate way. Together with his contemporary, Willem Claeszoon Heda, they became the highly regarded exponents of the dinner piece or “ontbijt.” Both of them were experts in handling texture and reflected light. The works of Claesz were often allegorical, using skulls as reminders to viewers that humans are mortals. The artist movement called “Vanitas” had an influence in the artist’s still life paintings. The genre, which portrayed objects with heightened symbolisms of faded flowers, rotten food and skulls were reminders that life is brief and that death is inevitable. Vanitas became a twin to Realism that Claesz and Heda practiced, just like several other Old Masters in the region, including Harmen van Steenwyck (Delft School), Frans Snyders (Antwerp School), Rachel Ruysch and Willem Kalf (Amsterdam School) and Jan Davidsz de Heem of the Utrecht School. Pieter Claesz was a member of the Haarlem Guild of Saint Luke in 1617 and in 1634, he was registered as the teacher of Nicolaes Berchem, his son, also an artist, although he painted landscapes rather than still lifes. His other pupils were Jan Jansz Treck, Floris van Schooten, Christian Berentz, Floris van Dyck and Evert van Aelst. Claesz’s typical palette contained monochrome colors such as brown, green and gray, with strong yellow used for contrast. Later in life, his colors became rich and lavish. 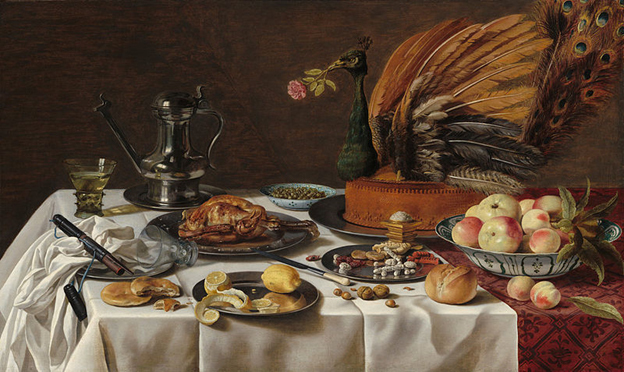 Some of his major works include Still Life with Salt Tub, Still Life with Fruit and Roemer, Crab and a Peeled Lemon, Still Life with Roemer, Still Life with Skull, Vanitas Still Life with Spinario, Still Life with Turkey Pie, Vanitas with Violin and Still Life with Musical Instruments. These painting are found is various museums and galleries in Europe and Australia. The career of Pieter Claesz had three phases, and each one showed a different style even if the differences were slight. When he first started until year 1625, his paintings showed a table with fruit and spices, drinking glasses, silverware and crockery. His colors then were crisp and clear. 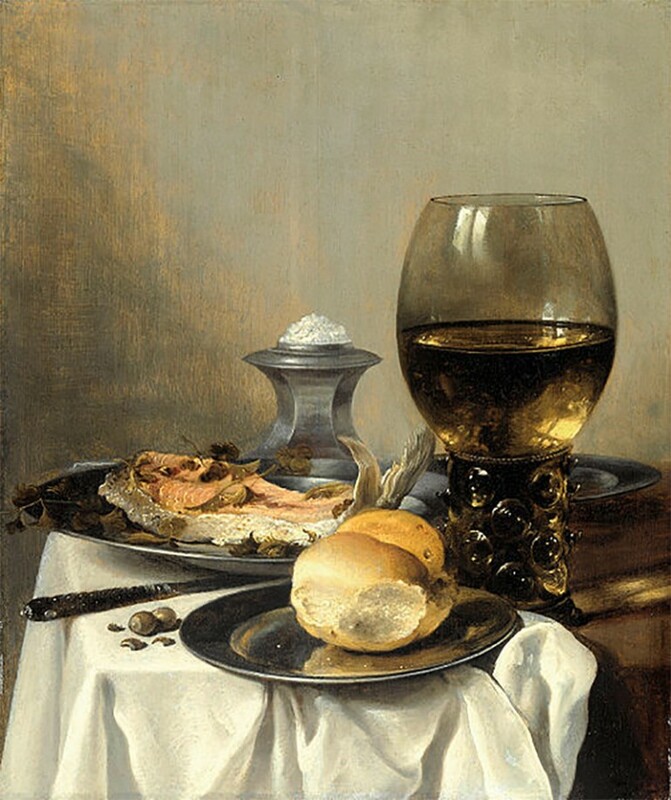 From 1625 to 1640, due to the changing taste of patrons, the number of items on the table were reduced, usually showing a bread roll, a herring on one plate as well as a glass. For added depth, the edge of the table was cleverly used for perspective. Around 1640, more objects and more colors were added, and the tables often were laid out lavishly, with several luscious dishes, game, fruits, fine glass and a profusion of flowers. During the 18th century and early part of the 19th century, the genre of Dutch Realism went into obscurity. But it was rediscovered in mid-19th century by Theophile Thore-Burger, a French art critic who rediscovered the works of several Dutch artists such as Samuel Van Hoogstraten, Pieter de Hooch and Jan Vermeer, which eventually led to him to finding the works of Pieter Claesz, and gave the great Old Dutch Master his well-deserved recognition.